I’ve mellowed in the last week or two towards Delia, but not her new series. A lot of criticism has been heaped on the ‘reality’ segments of the show, as Delia goes to friends houses, book signings, the Norwich Football Club grounds (admittedly it is toe-curling when she tries to relate, cockney accent and all, with the players in the dressing room) and I think some of it’s justified. Following Delia around to support Norwich isn’t the same as Nigella shopping for food or Jamie opening a restaurant. That said, it has been an insight into her character; how she dislikes people tasting tv food with a ‘ mmm delicious, to her nerves on doing live demonstrations, to her plucky mum who raised her alone during WW2 and her faith, too. I actually like Delia a lot more from watching the shows, even her banter with husband of 37 years, Michael, which makes the dissappointement in her new recipes even worse! Frozen fish, vegies etc are undoubtably an asset to busy cooks. Tinned meat though? Despite Delia getting the food standards people to agree it probably has the same nutritional content, providing it’s prepared in the same way you would at home.. I’m sorry but tinned meat is awful – just think what preservatives it must contain to keep it edible. If Delia is truly concerned about people not cooking she should have produced just simple cheap meals – not fancy convenient ones that use ingredients people distrust. Nigel Slater says she’s naughty for ‘breaking the rules’.. I’m sorry but she’s not doing anything revolutionary. Nigella has been evangelical on having a good storecupboard for years so that meals after work are easy but still tasty. Unfortunately for every good recipe, sea bass with pesto, you get a weird peruvian potato wedges with hard boiled eggs, peppers, cottage cheese sauce and olives…when everyone knows you just need sour cream and salsa with wedges. All the segments where food scientists give her the OK on her cooking methods and ingredients indicate Delia knew she was going to get flac for this new angle on cookery. I bet she’s kicking herself for not filming her Kitchen Garden book she did with Gay Search ( Jamie did it instead, much more rustic though!) – it would have been less controversial – but from the reality segments, including Delia at AGM meetings and her own admission she can’t be ‘gentle’, I don’t think she’ll be bothered. Sales are going well for the book at least and the McDonald ads on her website can’t hurt the income either. Here’s my Easter cheat, we had a half leg of lamb (NZ of course), and it weighed just under 1kg. I slashed the skin to make two big gashes and filled them with a paste made from chopped fresh rosemary, olive oil, garlic and salt and pepper. Then we remembered we had a jar of Waitrose Puttanesca in the fridge, which has anchovies, capers and olives.. so we added that too. 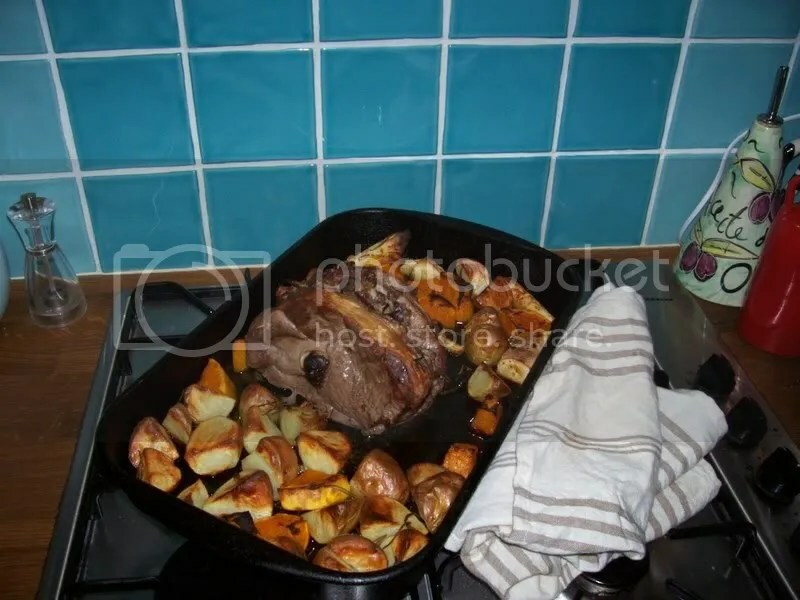 I placed the lamb with peeled butternut squash, parnsip and just quartered potatoes in the same roasting tin and cooked it all for 1 hour in a fan oven at 200 celcius. I made a gravy by adding flour, then water to the juices in the pan, plus seasoning. ‘Mmm delicious’ Sorry Delia. « Five men and a baby?